Ted has always been a reasonably good sleeper but on the odd occasion we have a few weeks of madness where he decides he does not want to go to bed or stay in his bed in the early hours of the morning. These nights prove exhausting for all of us and we try everything we can to get him to sleep well. 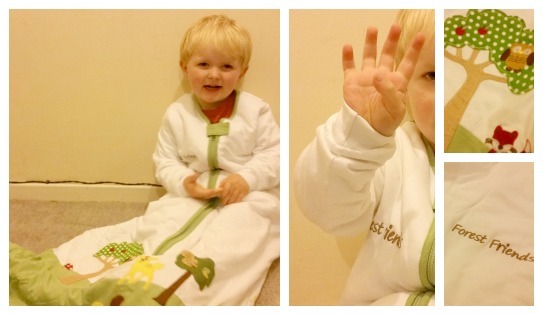 Some nights he refuses to wear any pyjama's to bed and I wondered if that was what was causing him not to settle. 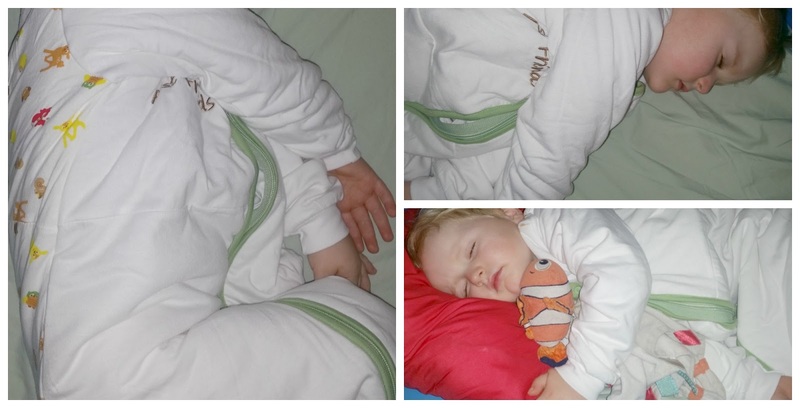 So I tried out the Slumbersac sleeping bag with sleeves to see if he was getting cold. I am pleased to say it worked a treat! I did make the mistake of telling him it was a sleeping bag though and he thought he had to sleep on the floor like he would in a camping type sleeping bag. I let him do what he wanted and made him a little camp bed on the floor and after weeks of hour long battles at bed time I was shocked to find him fast asleep less than 5 minutes later. Not just that, after I snuck him back into his bed he slept through until our alarms went at 6.30! He struggled to walk around in the Slumbersac as it is quite long and despite having a zip opening at the bottom he couldn't quite get his little feet out of the bottom. I think this may be where the Sleeping Bags with Feet may have been a better choice. The sleeping bag we have is the Forest Friends Winter design. It is a 3.5 tog so lovely and warm and the sleeves mean that Ted doesn't need to wear his PJ's if he doesn't want to and is still perfectly snug. The fabric is so soft and the woodland applique on the front is beautiful. We did have a slight fault on our review sample that there were a few loose stitches on the middle zip but I can easily tack these back on. I made the brand aware and they have assured me they will check all future stock in case this is a manufacturing issue but haven't had this happen before. These things happen though and they would have replaced the item had I not been happy to fix it myself. I always had sleeping bag's for Ted when he was small but after he outgrew his last one I didn't think anywhere did bigger sizes so I am really pleased we have found one that fits and I think this will last him a good few years still. That is if he still wants it when he is a big boy! I really love Slumbersac as a brand and would recommend you check out the sale page on their website for some great bargains. This Sleeping Bag with sleeves is only £23.99 which I actually think is quite reasonable compared to a lot of brands on the market and it is essentially replacing a duvet so worth investing in a well fitted, comfortable design.